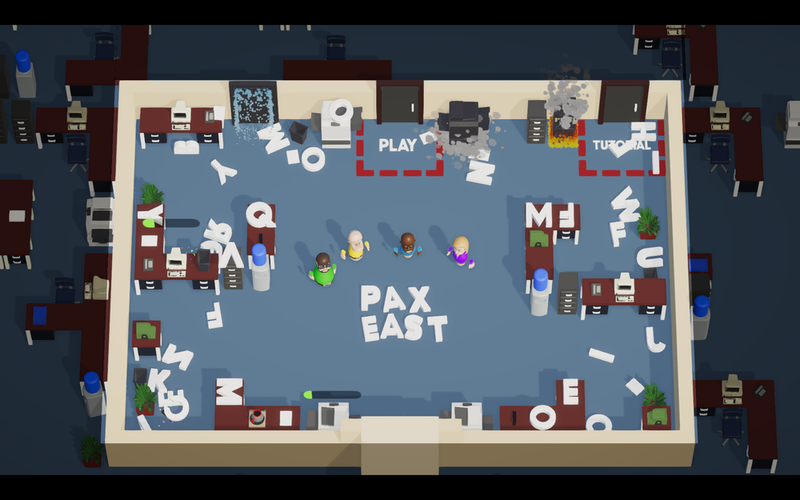 Office Mayhem is a competitive local co-op game, where players compete against each other to complete the most tasks within the office before the work day ends. Players win by having the highest score at the end of a 5 day work week, and are crowned the employee of the week. Project Description: This project was created as our senior capstone class project. The game was one of the 10 games to make it past the round of cuts after 12 weeks of development. I joined the team after this round of cuts where we continued to work on the game for another 14 weeks. When I was given the rules that I could not have tight hallways, no hiding things behind walls, and not to create claustrophobic areas. With these rules I was able to quickly create a variety of levels. After creating the levels, they were tested at our quality assurance lab on multiple days with up to 20 testers each session. This gave me a large amount of data on how each level played and what didn't work with the design of the level. 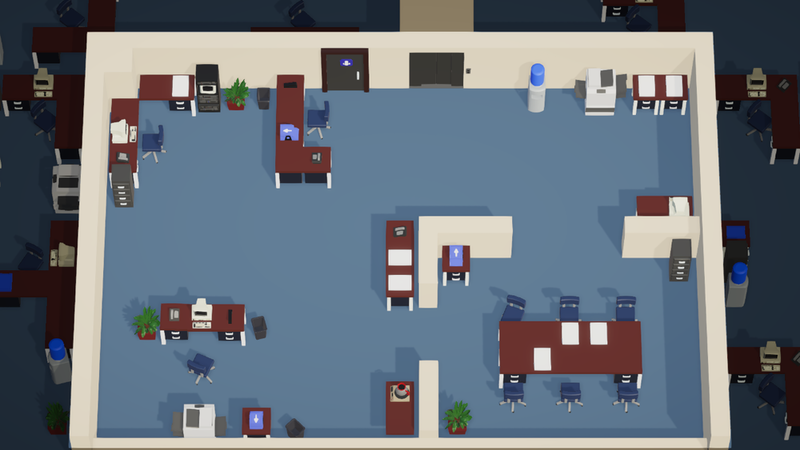 This allowed me to quickly iterate each level to the point that it was balanced for all players and I removed any areas that allowed one player to set up a "mini" office that other players could not stop, allowing for an unfair advantage to that player. Coming onto this team there was only one level in the game. This was great for me because it allowed me to see what the team wants in the level design while also allowing me the freedom to come up with my own designs and progression. The design of the level progression is for the players to play through five levels per each game, with each level representing a day in the work week. Each of the days will pick one of three levels, allowing for me to be able to control the difficulty of each level while still allowing for each game to be different. The above images show the 3 variations for the 5th work day in the game. For levels one through five I wanted the designs to reward the players for learning the mechanics in the later levels. I wanted levels one and two to be very open and forgiving to the players. 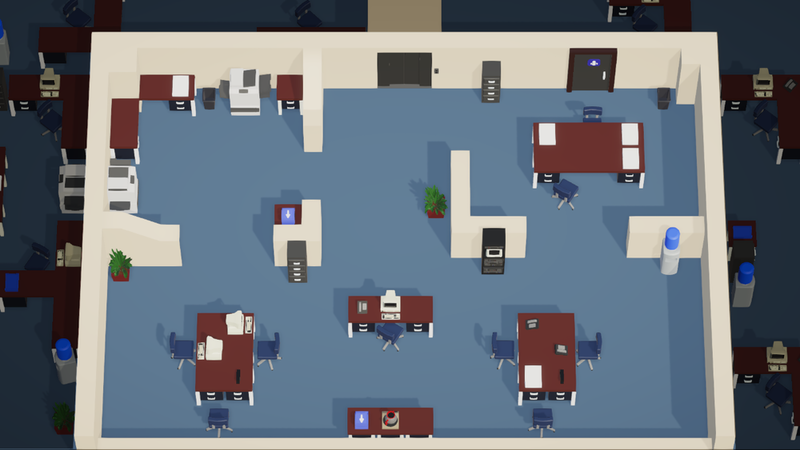 By forgiving, I mean that I want the levels to have an even distribution of desks, filling cabinets, and other supplies so that players are always able to quickly complete each task. In the later levels, three, four, and five, I wanted the levels to more difficult for the players to be able to do all the tasks, to promote moving around the level and also making use of the ablity to break and move objects around the level. I want to encourage this type of interaction because it encourages the players to experiment and discover some of the more hidden interactions in this world. Below are levels 1 through 5's concept sketches and then the levels built out in engine. For levels 6 through 10 I wanted to start pushing the limits for what I was able to do in terms of changing up the flow of the space, while still staying somewhat close to the feel of levels 1 through 5. 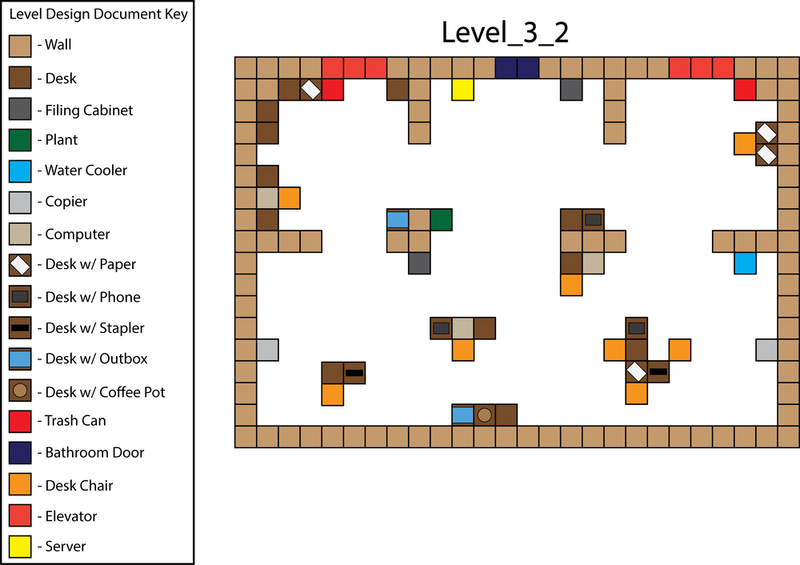 For levels 6 and 7, I wanted these levels to be more open versions of levels 1 and 2. In level 6 I removed the corner wall in the center of the level and moved the large table into the center. This really opened up the level. I also did the same for level 7, but instead of a large table I built a square out of desks with openings in the center of each side. This layout really opened up the level and is one of the levels in testing where the mechanics like stealing objects and tasks really click for the players. For levels 8, 9, 10 I continued the trend of using the corresponding level, 3,4,5, and changing some of the interior walls and the layout of the desks. The reason for making this set of levels was to create levels that felt similar to the first set of levels, but that challenged experenced players to learn new tactics and to change their play style. Below are levels 6 through 10 with the concept sketches and the level built out in engine. Levels 11 through 15, I wanted to push the mayhem up to 11. For these levels I wanted to experiment with having multiple elevators and non-rectangular levels. For example on level 14 I have an elevator on each of the outer walls, pointing towards the center. This layout creates an area of mayhem in the center of the levels where the players have to fight over the paper and other resources that are launched into the level. And in level 13 I broke the back wall up into three chunks and moved the outer two up. This creates a push to use the lower part of the level more and force players to have to move around to use the desk space. Overall the idea for this set of levels was to really turn up the mayhem and really push the players to experement with new styles of play. Below are levels 11 through 15 with the level documenttation and the level built out in engine. 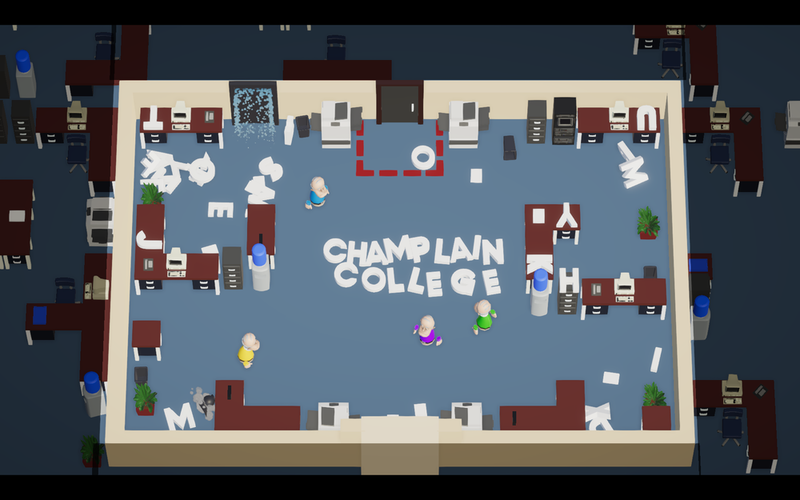 All of the levels have been tested through Champlain College's in house QA lab. The testing procedure that I used for testing these levels was an adhoc testing style. I would have the tester play through a set of levels, such as 1 through 5 or 6 through 11. and then I would have the testers rate in terms of enjoyment and fairness on scale from 1 to 6. The reason for choosing the 1 through 6 scale is so that the testers must pick a side on whether they liked the levels or did not. This helps prevent the data from containing a large number of indifferent responces.